FÁILTE Ireland recently hosted 30 international golf tour operators who stayed and played golf along the Wild Atlantic Way including Ballyliffin. The tour operators arrived in the country from across the world including the US and Canada, France, Germany, Lithuania and the UK among others. During their stay, they also met more than 60 Irish golf suppliers from across the country at a workshop hosted by Rosapenna Hotel and Golf Resort in Downings. 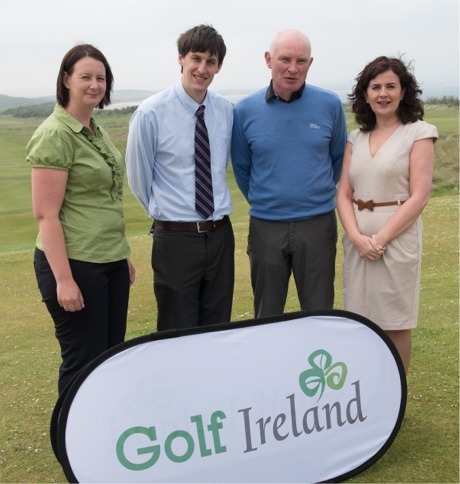 Pictured at the recent Fáilte Ireland Golf Ireland seminar is Grainne Dorrian, Donegal Golf Resort; John Cassey, Rosapenna Golf Club; John Farren, Ballyliffen Golf Club and Joan Crawford, Fáilte Ireland at the Rosapenna Golf Club. Photo - Clive Wasson. Martin Donnelly of Failte Ireland said: "Failte Ireland is committed to supporting sustainable growth in tourism in Ireland through a better regional distribution of our international guests to areas such as that in the northern half of the Wild Atlantic Way, including Donegal, Sligo and Mayo." Figures show that more than 200,000 overseas visitors play golf during their visit to Ireland every year, contributing almost €220 million to the economy.